Forest of Dean Wildlife & Nature Diary: Hornets for BBC Autumnwatch! On Saturday 1st October I took a film crew from BBC Autumnwatch out into the Forest of Dean in search of wild boar and any other wildlife, which would be good for filming. I showed them a couple of wild boar wallows and two adders before heading off to an old tawny owl haunt, hoping that he still occupied it? He wasn't there and it soon became evident as to why! 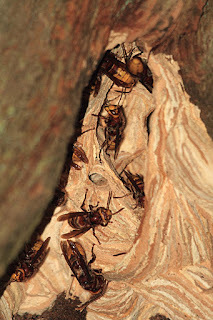 As I approached the roost I could see hornets buzzing in and out, and it wasn't until I got close that I realised they were actually building a nest. Hornets build their nests in the spring, not autumn and it can only be the insane hot weather we have been seeing lately that provoked them to start building at the beginning of October. The hornets typical behaviour in early autumn is to leave the nest to mate and shortly after mating the male hornet will die. Towards late October the workers and unfertilised queens also die just leaving the fertilised queens, which survive the winter. Anyway, I wanted to get some pics and footage of them myself as I knew it wouldn't be long before they realised that autumn is on the way and would soon leave the partly built nest to mate. So I went back out to film and photograph them. As I approached the nest they were buzzing around my head as they were flying in and out, so I approached with caution as just one sting would have sent out a pheromone, which would have mobilised the whole colony to attack. 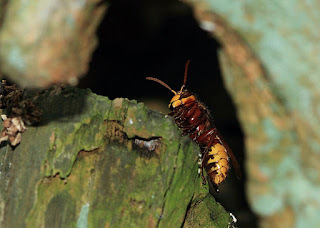 The sting from a hornet is far worse than that of a wasp, due to their size and venom yield, and as they have no barb on the stinger like the wasp, they can sting multiple times. 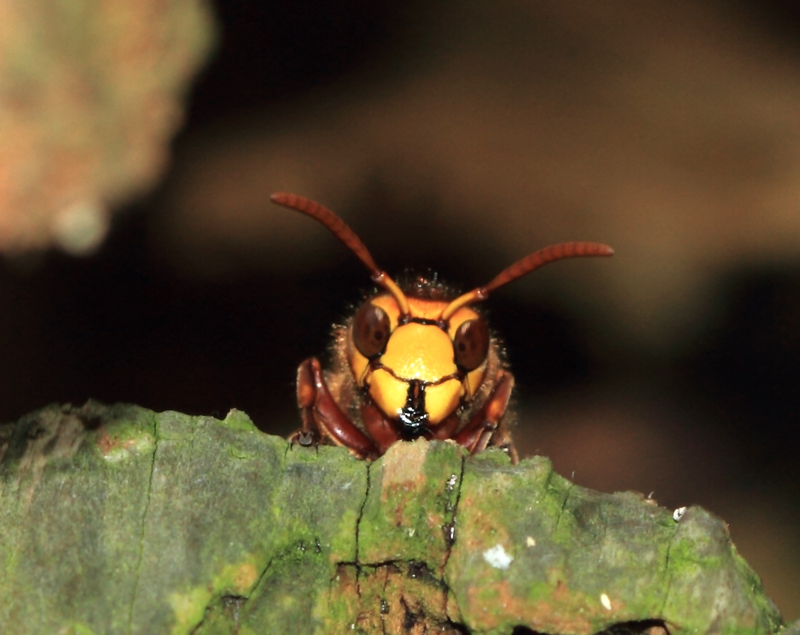 I was within a few feet of the nest and noticed a guard hornet sat at the entrance, watching me. As he kept his eye on me, he was also watching every single hornet enter the nest and it was fascinating to watch him rear up like a preying mantis if I got too close, or if a worker hornet got too close to him. Here he is, watching me as I got as close as possible. Photographed using a 100mm macro lens from approx 6 inches away. And here he is in all his glory; all 5cm of him! I had to stretch to grab a shot of the inside of the nest and this is when he reared up like a preying mantis, so it was a couple of quick shots before he told me off! Although I didn't get to film for Autumnwatch in person, I know that these hornets along with wild boar and possibly an adder will be featuring on the first show of the series on Friday 7th October. I hope they liked the varied wildlife I showed them and I also hope it will make for some interesting viewing, even though I have not heard from them since. My time spent with them, helping to give some unique and unusual wildlife behaviour opportunities should have warranted a thank you at least? Maybe my name will appear in the credits as a special thank you, but I doubt it. Sorry to finish on a duff note, but without people like me they would have to work a lot harder and probably wouldn't stand a chance of finding hornets building a nest in October!!! "I recieved a text message from a member of the film crew thanking me for my time, helping them find the hornets, adder and wild boar wallow(s)." It was a pleasure to help and would love the opportunity to help again in the future. It was a bit surreal watching it on TV! You should have got paid up front. They got some good film in the end, and it must have been satisfying to see it on the box, even though it seemed that Michaela found the hornets! Only problem with hornets is they never look their true size in pictures.